Blown out over the sea by the wind, the balloon is suddenly caught by a violent storm. Babar and Celeste tremble with fear and cling with all their might to the basket of the balloon. So yea, the balloon crashes, setting off a series of events that get stranger and stranger with each page: fierce cannibals, a whale ride, being sold to the circus, a skiing trip to the mountains, a war with the rhinos as well as eleven singing canaries and a cunning little monkey. Really, the adventure is high in this one. 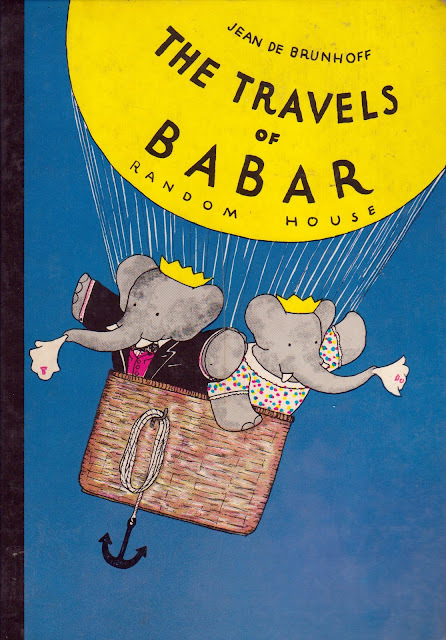 Hands down probably the best Babar book ever, and it doesn't include any somber moments at all about that unfortunate business of Babar's mommy getting gunned down that so taints the first book. As the Kiddie Records Weekly version sings... "Long live King Babar, ditto Queen. Of all the elephants, they're of the best." Here, here. 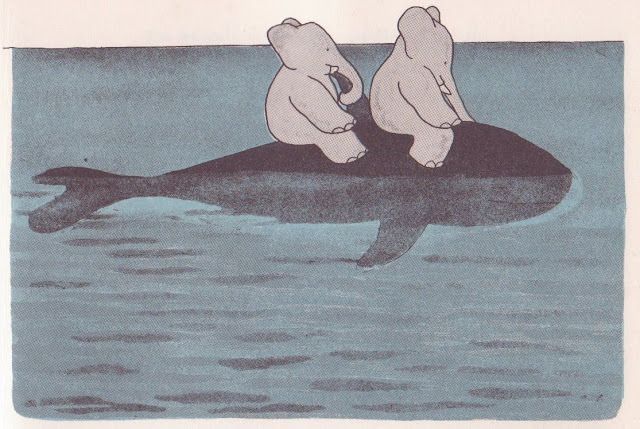 Babar is one of my favorites, for sure!!! Fun!! Oh I want that book. I collect Babar little toys and I have a little Babar suitcase I put them in. I plan for them to be special travel toys for my future kids. The other day I found a paper back book with and audio cassette . Just have to find a cassette player! Babar is so sweet! This book is a true treasure!